Our reception staff will advise you for the initial consultation fee and any Medicare rebates that may apply at the time of making the appointment. We ask that all consultation fees be paid on the day of your appointment. We accept cash, cheque or credit card (excluding American Express or Diners). A current referal from your General Practitioner or another Specialist is required for you to claim a rebate through Medicare. If you do not have a valid referral we can still provide services, however you will not be elligible for a Medicare rebate. Dr Weinrauch does not conduct medico-legal or insurance claim examinations. Dr Weinrauch does not accept workers compensation insurance or third party claim insurance. Patients with these insurance types will be personally liable for their consultation and surgical fees at the time of service provision. After your initial consultation, if surgery is recommended, we will provide you with an estimate of the fees that apply for your procedure. Your itemised quote will include an estimate of the Surgeon's Procedural Fee, Surgical Assistant's Fee (if applicable) and an estimate of the Health Insurance Fund/ Medicare rebates that may apply. Settlement of your account is required prior to your procedure. Occasionally the procedural fee is higher or lower than your initial estimation if variations are required during your procedure - in these cases a refund or additional payment applies. You will also be provided with details of your Anaesthetist to obtain further information about your anaesthetic, including fee estimates any rebates that may apply. Clinic staff can only provide an accurate fee estimate after your clinic consultation, as the estimate is determined by the type, nature and complexity of the operation as recommended by Dr Weinrauch. Some health insurance policies will contain exclusions for particular procedures. If your policy contains an exclusion for your procedure, health fund rebates will not apply however you may still be eligible for a Medicare rebate. Uninsured patients (including patients with policy exclusions) undertaking surgery in a private hospital will also be personally liable for their entire hospital facility fee - this includes the operating theatre fee and prosthetic implant costs. For hip replacement and hip resurfacing procedures, the hospital facility fee and prosthetic implant costs are significant. In addition, uninsured patients may also be personally liable for the costs associated with the management of unexpected complications that may occur after your procedure. This for example may include the costs associated with admission to a cardiac care or intensive care facility. For these reasons, we recommend hip replacement and hip resurfacing procedures are only undertaken in a private facility if you have adequate insurance. You can "upgrade" your policy at any stage to include coverage for excluded procedures, however a 9 - 12 month waiting period generally applies (depending on your health insurer). A gap is the difference between the fee charged by your health care provider and the rebate you can claim through Medicare. For surgical procedures, your health insurance provider will also contibute some assistance to reduce the gap. The amount of assistance varies between different health insurance funds. The remainder of the gap represents an 'out of pocket' expense to the patient. For clinic appointments (out of hospital), your health insurance provider will not financial provide assistance however Medicare rebates will still apply. The Medicare Benefits Schedule (MBS) represents the amount of financial assistance the Commonwealth will provide for people undertaking health care outside of public hospitals. The amount of assistance is determined by the government, taking into account economic and budgetary constraints. Since the development of the MBS in 1985, the Medicare schedule has not increased in line with inflation to reflect the increasing costs of health care provision. This includes sequential "Medicare Freeze" episodes, where the MBS has been indexed at 0% growth - effectively widening the gap even faster. Health insurance funds do provide financial assistance to reduce gap expenses, however the degree of contribuation is variable. For example, Australian health insurance funds at present provide no financial assistance for a doctor's consultation, unless you are admitted within a hospital. Even when a patient is admitted into a hospital, most health insurance funds will co-contribute only a small proportion of the amount allocated by Medicare - this is rarely enough to eliminate gap "out of pocket" expenses. The Australian Medical Association (AMA) issues a regularly updated listing of recommended average fees for the provision of medical services. The AMA schedule is widely considered the independent standard of what constitutes fair and appropriate fees for the provision of medical services within Australia. 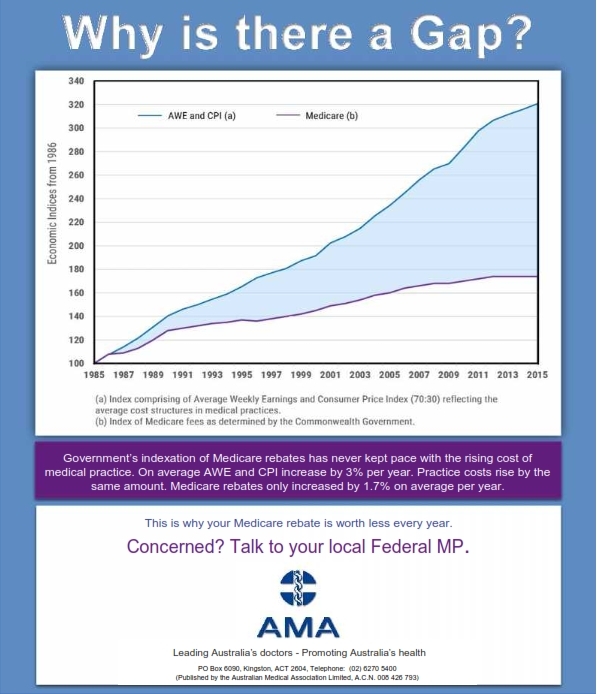 The AMA fee schedule has increased in line with standard inflation since 1985. Due to inadeqaute growth in health fund and government rebates provided to patients over many decades, the difference between the AMA fee schedule and the MBS/ Health Fund fee schedule has increased over time. This difference "Gap" is passed onto the patient, depending on their level of insurance cover. Patients holding health insurance policies that provide rebates with reference to the AMA fee schedule do not incur a gap when the doctor charges the recommended AMA fee. Patients who hold insurance policies that provide coverage less than the AMA fee schedule are liable for a gap payment when the doctor charges the recommended AMA fee. An Item Number is a code which identifies a particular medical service or procedure. For example, Total Hip Replacement is identified by the item number '49318'. Some operations involve more than one part, and therefore are associated with more than one item number. When provided with a quote for your operation, the item number(s) will be listed. This information is required by your health insurance provider to calculate the benefit you will receive for this service. The number(s) will also be required by the hospital and other providers of health care services to calculate fees associated with your care. You are strongly advised to check with your helath insurance provider if you have "exclusions" on your cover. Lower cost insurance premiums often have fine print exclusions which in particular apply to joint replacement procedures. As a guide to check your elligibility, quote item numbers 49318 (Hip Replacement) and 49366 (Hip Arthroscopy). What are "No Gap" or "Gap Cover" schemes? "Gap Cover" represents what individual health care funds would like to pay for medical services. Gap Cover rates are determined by health insurance funds themselves, without appropriate consultation with physicians and other health providers within the medical industry. Conditions associated with Gap Cover over arrangements are determined by the health insurance providers themselves and therefore differ between policies. Most surgeons do not participate in Gap-Cover arrangements or participate only on a selective basis.